A messy desk. 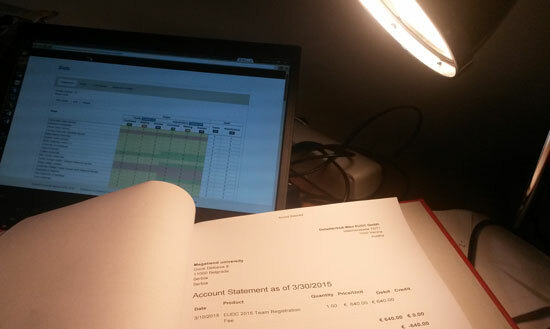 Registration generally requires a lot of documentation and paper-work alongside the virtual conversations. Software like Debreg can significantly reduce the workload. Slot management and reallocations, including email handling of requests by participants. Notably, Vienna EUDC Registration also shows us for the first time how EUDC differs from a smaller intervarsity tournament. The number of payments we handled for Vienna IV were considerably smaller, the email flow lower, and liquidity was never a major issue. 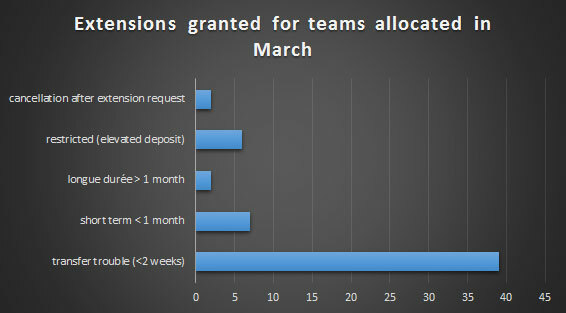 Obviously, the effort to manage slots increases with the number of teams. However, EUDC council rules also play their part. Vienna EUDC is a tournament with an extremely high number of institutions and an excessively long waiting list. Due to council registration rules, many registered institutions were only granted one team and reallocations happen team by team. Compared to Vienna IV registration, which worked in two team bulks, this has already doubled the amount of work on reallocations per institution, in addition to the higher number of institutions registered. We decided to create special software handling this data. Our registration system DebReg (by Roman Korecky) minimised the workload especially in the allocation and reallocation of slots. Societies can log on their own accounts and are therefore always up to date about granted and pending slots and related payment balances. However, an issue that remains unsolved, is the identification of double entries and non-eligible societies. In the interest of liquidity, doubles and non-eligible societies need to be eliminated from the list quickly, as their slots otherwise entail the danger of remaining unpaid until close to tournament. The current rules by EUDC Council do not help in this situation. As decisions on eligibility are not able to be mare prior to pre-council, this creates the perverse incentive to manipulate the registration process and system, leading to double registrations. This can include the creation of non-eligible societies. From a convenors point of view, I would like to keep the number of double entries and non-eligible societies to a minimum, but at the same time be sure not to reject any legitimate institution. With a decision not before pre-council, this is simply unachievable. The liquidity constraints of Vienna EUDC (and probably any major competition) are due to the fact that venues and hotels require down payments long in advance. This is unavoidable, as it would be unreasonable for a hotel or a venue to accept a booking of 800+ people without any sort of commitment in advance. We are trying our best to manage this challenge with relatively quick payment deadlines and a set of extensions we offer to societies with payment problems. Our payment extensions follow strict internal guidelines and we try to be as fair as possible in granting them. We hope this system manages to reconcile our liquidity necessities with inclusivity towards poorer societies. Out of about 60 requests for extensions received, the vast majority was for short term payment issues. Even though we strictly applied internal guidelines, only two requests ended in a cancellation before an extension period could be agreed upon. Lastly, the sum of money accumulated by down-payments is huge. As the registered limited liability company Debattierklub Wien EUDC GmbH runs Vienna EUDC, we are not only committed but also legally obliged to confer to strict bookkeeping standards. This extra scrutiny is necessary for two reasons. The processing of a vast number of transactions is prone to human error. However, small errors can cause significant damage. Proper bookkeeping and budgeting as conducted by our finance team is the minimum we must do in order to make sure Vienna EUDC becomes a success. A vast sum of money entails a huge (fiscal) responsibility. At Vienna EUDC we are working to increase transparency for participants, but also for the core org com, who invests a lot of time into the endeavour and has a right to be fully informed about the transactions in the project. At Vienna EUDC we are therefore working with two parallel systems: On the one hand we have a formal bookkeeping system hosted at our tax consultant. It mainly serves the correct affairs of the company and handling taxation. On the other hand, DebReg has a built in payment management which informs the participants, and allows us to double check each and every booking. In conclusion, I think that proper registration software is a major improvement to Vienna EUDC. Yet, the challenges of registration at EUDC are hard to compare to those of smaller tournament. Even the best software cannot replace the brains that handle a couple of hundred emails each week and that spend multiple hours a day crunching the numbers behind the project. We are committed to spending many hours handling your requests and emails – after all participants at Vienna EUDC deserve the best service we can provide! Payment extension guidelines will be disclosed with the financial report on Vienna EUDC after the tournament. I already explained in previous Crow’s Nest posts that studying tax law in-depth became a necessity, too, but that’s a different story.